#TPTSELLERCHALLENGE Dreaming BIG today! | Primary Planet! So, as I was sitting on the couch with the hubba last night I was telling him about this week's challenge. It was a great conversation about goals and dreams. So, we were talking about what I would do if I could ever drag myself out of my classroom. So, I told him. I would own a bookstore. Wouldn't that just be wonderful? 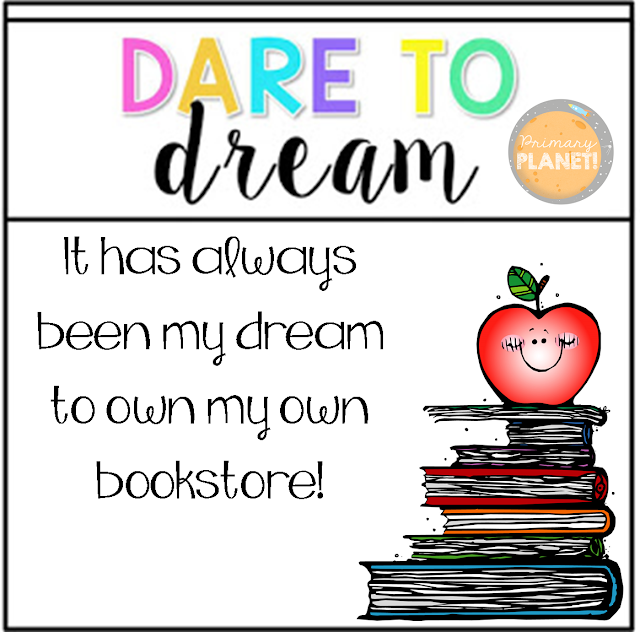 See what other people are DARING TO DREAM here! You can also link up your own! I think that's a wonderful idea! I love bookstores. I'm definitely an actual book reader instead of digital books. I hope that your dream comes true someday! And I totally know what you mean about 'if you can pull yourself away from the classroom'. I'm the same way. I think a lot of other things would be cool, but I'm just not sure if I'm ready to leave my kids. Thanks for sharing! Hi Cassie! Thanks so much for stopping by! I am a real book reader as well. Digital books just aren't the same! What a fabulous goal!! I am a proper book worm and this just sounds amazing!!! Wishing you all the success for your TpT store for you to be able to achieve your fabulous goal! !